Our pocket-sized small angels are approximately 3cm in length. At 30mm high, these mini-angels are available in various different types of stone. Available.. This small Hematite Angel stands approximately 30mm tall... Hematite is said to boost self..
Obsidian small angel. Obsidian is volcanic and glass-like. Repels negative energy. 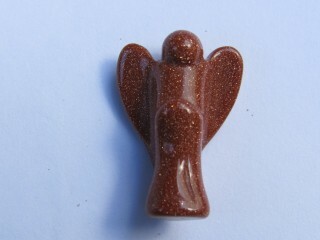 A very direct ..
At 30mm high, these mini-angels are available in various different types of stone - this one is made.. This Red Goldstone 30mm Angel is Man-Made with glass containg copper flecks. Said to be a stone of s.. 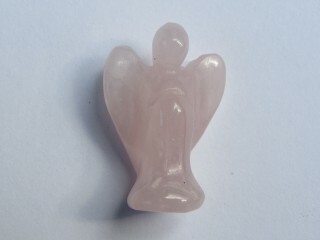 This 30mm Rose Quartz Angel is the colour of love! Encouraging love everywhere, rose quartz is a pow..